The vast majority of people who have heel spurs feel the asscociated pain during their first steps in the morning. The pain is quite intense and felt either the bottom or front of the heel bone. Typically, the sharp pain diminishes after being up for a while but continues as a dull ache. The pain characteristically returns when first standing up after sitting for long periods. Treatments for bone spurs and plantar fasciitis include Stretching the calf muscles several times daily is critical in providing tension relief for the plantar fascia. Some physicians may recommend using a step to stretch, while others may encourage yoga or pushing against a wall to stretch. Icing after activity. A frozen tennis ball can provide specific relief. Rolling the tennis ball under the arch of the foot after exercise can lessen pain in the area. Taping is also recommended at times. Several manufacturers of sports tape have plantar fascia specific lines. Orthotics are a good idea for those on their feet during the day. Orthotics can provide cushioning and relief. Cortisone shots in the fascia can provide temporary anti-inflammatory relief. Losing weight is perhaps the most effective method of improving heel and foot pain. Those who are overweight are far more likely to report these syndromes. Approximately 10 per cent of the population may have heel spurs without any heel pain. Whilst recent research has raised the question of whether or not heel spurs are the result of the body trying to increase its base of support, heel spurs are still considered to be the result from strain on the muscles of the foot (in particular the plantar fascia). This may result from a biomechanical imbalance, such as over pronation. For the most part, it is a genetic condition. You develop it by inheriting a foot type that is prone to the mechanical irritation that leads to the problem. If you have this particular foot type and wear shoes that rub and irritate the back of the heel bone (calcaneus) where the Achilles tendon attaches, then you are even more likely to develop this type of bursitis. The contributing factors include a supinated foot type, a heel bone with a prominence (or pointed shape that stick out toward the tendon) at the back, a tight Achilles tendon (referred to as Equinus by doctors), and a high arch. All of these factors simply make it more likely that the back of the heel will press against the shoe and rub. As the tendon gets rubbed the wrong way, the bursa starts to develop and fill with fluid. This response is really your body's way of protecting the tendon from damage, but it backfires. The friction from all that rubbing causes the bursa to become inflamed and swell. This causes the bump to become red, hot and stick out even further. Much like a sore thumb, it then gets irritated by even the softest shoes. Below is a list of common signs and symptoms of retrocalcaneal bursitis. Recognizing and treating symptoms early can prevent retrocalcaneal bursitis from becoming chronic. Swelling. 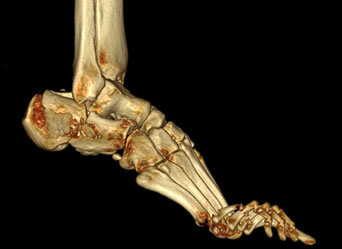 The retrocalcaneal bursa is located behind the Achilles tendon, just above where the tendon attaches to the heel bone. When the bursa is inflamed it will cause visible soft tissue swelling near the top of the heel bone. It is worth noting that bursitis of the retroachilles bursa, which is located between the Achilles tendon and skin, can manifest slightly differently: swelling may be more distinct, appearing as a hard lump behind the heel. Retroachilles bursitis is also more likely than retrocalcaneal bursitis to cause the skin at the back of the heel to turn red. In addition to R.I.C.E., there are a number of other treatments to reduce swelling and any associated pain or discomfort due to heel bursitis. Orthotics or change of footwear. Wearing an orthotic device such as a heel insert can encourage better mechanics in the foot and reduce irritation of the retrocalcaneal bursa. Some people do not need special orthotics but simply need to stop wearing shoes with rigid heel and ankle construction and instead wear more supportive, comfortable shoes. Shoes with an "Achilles notch," a groove in the collar at the back of the shoe to protect the Achilles tendon, can be particularly helpful. (Almost all running shoes are designed with an Achilles notch.) Stretching and physical therapy. Stretching the Achilles tendon often helps alleviate pain. Once the pain is resolved it is important for the patient to continue a regular stretching program. Regular stretching reduces the chance of recurrence. What Is A Hammer toe? A hammer toe, or claw toe, describes a condition where the toe(s) become buckled, contracted or crooked. The toe could even cross over an adjacent toe, which is called a cross over toe. Any of the toes may be affected, but the 2nd and 5th toe are most commonly involved. If a foot is flat (pes planus, pronated), the flexor muscles on the bottom of the foot can overpower the others because a flatfoot is longer than a foot with a normal arch. When the foot flattens and lengthens, greater than normal tension is exerted on the flexor muscles in the toes. The toes are not strong enough to resist this tension and they may be overpowered, resulting in a contracture of the toe, or a bending down of the toe at the first toe joint (the proximal interphalangeal joint) which results in a hammertoe. If a foot has hammertoe a high arch (pes cavus, supinated), the extensor muscles on the top of the foot can overpower the muscles on the bottom of the foot because the high arch weakens the flexor muscles. This allows the extensor muscles to exert greater than normal tension on the toes. The toes are not strong enough to resist this tension and they may be overpowered, resulting in a contracture of the toe, or a bending down of the toe at the first toe joint (the proximal interphalangeal joint) which results in a hammertoe. Surgery is the approach that is often necessary to correct hammertoe that fails to respond to nonsurgical management. Surgery is appropriate when the muscles and tendons involved in a hammertoe problem have become so tight that the joints are rigid, misaligned and unmovable. There are a number of surgical techniques for dealing with the complex range of joint, bone, muscle, tendon and ligament abnormalities that define each hammertoe's make-up. To correct a hammertoe deformity, the surgeon's goal is to restore the normal alignment of the toe joint, relieving the pressure that led to the hammertoe's development (this should also relieve the pain, as well). To do this, he or she may remove part of the boney structure that creates a prominence at the top of the joint. Tighten or loosen the muscles, tendons and ligaments around the toe joints. Realign the toe bones by cutting one or more and shifting their position, realigning muscles, tendons and ligaments accordingly. Use screws, wires or plates to hold the joint surfaces together until they heal. Reconstruct a badly damaged joint or replace it with an artificial implant. Why Do I Get Bunions? Wearing footwear that is too tight or causing the toes to be squeezed together are the most commonly blamed factor for the cause of bunions and hallux valgus and is undoubtedly the main contributing factor. This probably is the reason for the higher prevalence of bunions among women. However, studies of some indigenous populations that never wear footwear, show that they also get bunions but they are very uncommon. As they do get bunions, factors other than footwear must play a role in the cause, even though footwear is the main culprit for providing the pressure that causes the symptoms. SymptomsPatients with bunions will often display pain over the prominent bump on the inside of their forefoot (the medial eminence?). However, they may also have pain under the ball of the foot (under the area near the base of the second toe). Symptoms can vary in severity from none at all to severe discomfort aggravated by standing and walking. There is no direct correlation between the size of the bunion and the patient?s symptoms. Some patients with severe bunion deformities have minimal symptoms, while patients with mild bunion deformities may have significant symptoms. Symptoms are often exacerbated by restrictive shoe wear, particularly shoes with a narrow toe box or an uncomfortable, stiff, restraining upper. Many people with bunions are quite comfortable if they wear wide, well fitting shoes and give them time to adapt to the shape of their feet. A small pad over the bony prominence, which can be bought from a chemist or chiropodist, can take the pressure of the shoe off the bunion. High heels tend to squeeze the foot into the front of the shoe and should be avoided. It is often worthwhile seeing a chiropodist if these simple measures are not quite enough. The main goal of surgery is to realign the big toe joint in order to relieve symptoms, correct deformity and restore function. Surgery to remove a bunion is known as a bunionectomy. There are many variations of this operation and the type of surgery performed will vary depending on factors such as the degree of deformity, the strength of the bones, the person's age and the surgeon?s preferred approach. Most surgery involves the removal of the bony outgrowth (exostosis) and the realignment of the bones of the joint. Soft tissue structures such as the ligaments and tendons may be repositioned and the bursa may be removed. The insertion of screws and pins may be required to stabilise the bones in their new, realigned position.